Aside from the expensive ($1K+!?!) round trip ticket, the trip was fairly routine. I wanted to go to Akihabara but seeing that the fare was already taken from my own wallet, I doubt I’d survive my first hour there. Why? Akihabara is considered Otaku heaven with the best stores if you’re searching for anime merchandise. Software, manga, anime titles and even adult items (no I won’t go into detail), you name it, it’s there. Since Akihabara is simply out of the question, we went for the next best thing: Nipponbashi in Osaka. There was only one store that I really wanted to see there and the picture below should make clear. When I saw it, I almost broke into tears. 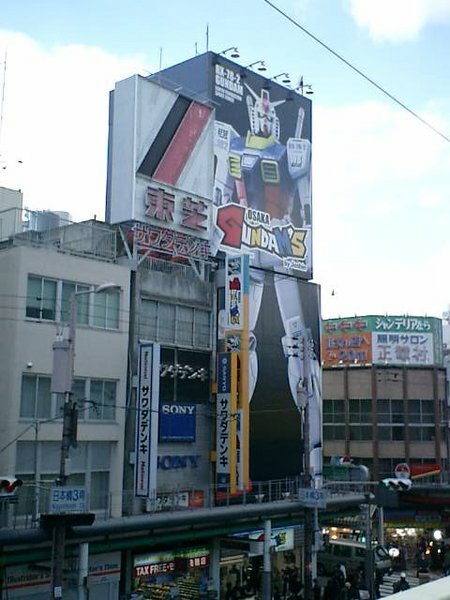 Aptly named Osaka Gundams, the store carries everything that a Gundam lover would want. I personally can’t describe the feeling after setting foot in the building but to put it simply, I was like a child released into a giant sandbox. ^^ I saw many Gundam kits that I really wish to take home but can’t. They’re either very rare or very expensive (20K Yen upwards o.O). I would’ve taken home a DESTROY model kit but I wouldn’t have enough cash to get home. Bummer. Anyway, I’ll be going to Kyoto after this to visit my friend who’s still on his hospital bed, recovering from a heart by-pass surgery. I’ll probably spending the rest of my stay there since we have lots to catch up to so I hope I’ll have time to take pictures. See you guys soon. Have a very Merry Christmas everyone! Have Something To Say ? Ano nga pala gawa mo dyan. Are you there for bussiness trip or just a pleasure trip? personal trip po. Needed it, BAD. uhh patay na. Wala talaga pics. Just read the next entry.